At our last MOPS meeting, our craft coordinator issued us a challenge. We made jar cookies; that is, we put the dry ingredients for cookies into a Ball jar to take home. After we baked the cookies, Anggie told us we should reuse the jar and then send her pictures. I had no idea what to do with my jar. Make a fancy pen holder? Fill it with marbles? Drink lemonade from my jar? Hmm. At first, I thought I added too much food coloring, but as I watched the jar, it reminded me of The Starry Night by Vincent Van Gogh. Another use for this simple Ball jar…teaching great art! 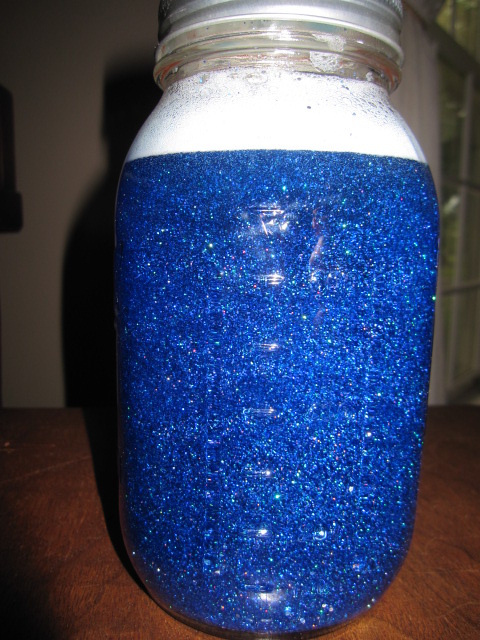 Fill your jar about halfway with hot water and add some blue glitter glue. (I bought a small bottle on sale, and squeezed the whole bottle into the jar.) Stir. Add silver glitter, blue glitter and blue food coloring. (If you can find some star-shaped glitter, that would add to the effect! I didn’t have any.) Stir, and fill the jar with water leaving about an inch at the top. Fill the jar to the top with vegetable oil. The oil is an unnecessary ingredient, but it did add some fun “bubbles” to the jar. Tighten the lid securely. 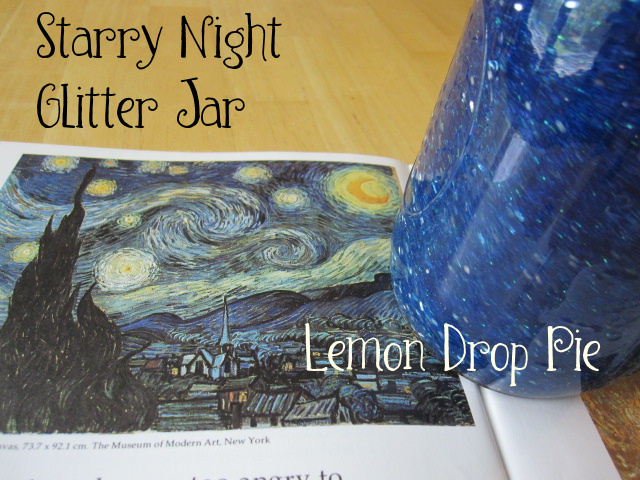 Shake and whirl to make your own Starry Night! I own a series of art books by Mike Venezia. 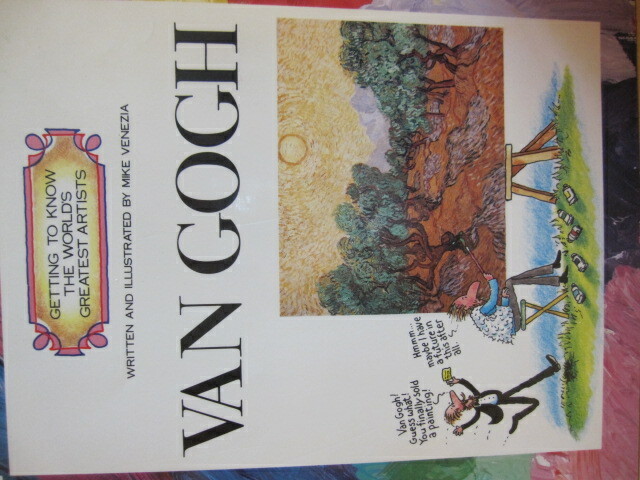 The library also has a lot of kid friendly art books which you can use to introduce Van Gogh and The Starry Night to your own kids. Van Gogh was a very interesting character! Speaking of Ball jars, I’ve also been the lucky recipient of a jar of strawberry jam from The Mayor of Crazyville. Yum! What other ideas for jars do you have? Leave a link in your comment if you’ve blogged about using jars. I’d love to see your ideas! What a great idea! My siblings would have loved doing something like this when they were younger. Great Idea. My niece loves snow globes so a tantrum jar (shake it when you're mad, then sit until all the glitter settles) would be perfect for her. I LOVE this idea Ginny..you are so creative! It's so pretty and I bet your daughters loved it! and YOU too! LOL That would definitely something I would enjoy!_Blessings! What a fun project for the girls. Also those series of books sounds really nice and a great way for children to learn about art. My recent post HERE'S WHAT I KNOW…..
One of my favorite paintings – I think we'll try this for my daughter. I don't know what I do with extra jars…usually I use them for vases or to store oats or chocolate chips or baking ingredients. My recent post Ladies Only Blog Share Link Party: Dedicated to Dad. This is cute..and a great idea. I used the Van Gogh book this year with Benjamin. I never went to MOPS meetings, they started out when my first one was a baby, but I have always been in total support of that great organization.